The ghost of a long-dead star, the W63 supernova remnant shines like a faint cosmic smoke-ring along the plane of the Milky Way galaxy toward the northern constellation Cygnus the swan. Its wraithlike appearance is traced against the region's rich complex of interstellar clouds and dust by an eerie blue glow. Spanning over four full moons on the sky, the beautiful image is a telescopic mosaic in twelve panels that combines 100 hours of exposure time using narrow band filters. It shows characteristic light from ionized atoms of sulfur, hydrogen and oxygen in red, green, and blue hues. 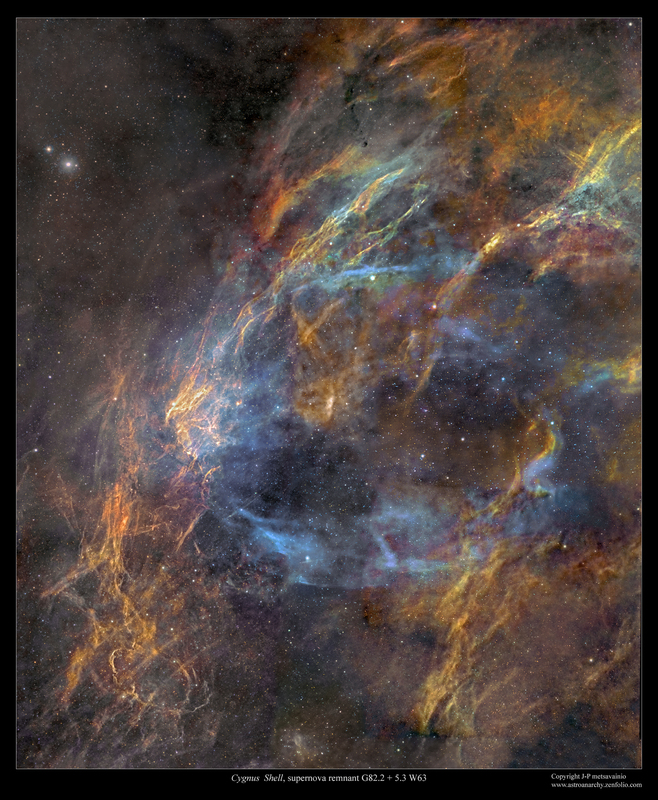 Likely over 5,000 light-years away, the visible part of the still expanding shell supernova remnant is around 150 light-years in diameter. So far no source has been identified as with the remains of W63's original star. Light from the star's supernova explosion would have reached Earth over 15,000 years ago.